Smithfield Foods is the world's largest pork processor. Several months ago, the Securities and Exchange Commission flagged possible insider trading on the acquisition of meat producer Smithfield Foods. On Thursday, the agency brought home the bacon. The SEC announced Thursday that Badin Rungruangnavarat, a trader based in Thailand, had agreed to pay $5.2 million to settle charges that he had traded in Smithfield (SFD) securities based on advanced notice of the deal, earning more than $3 million. 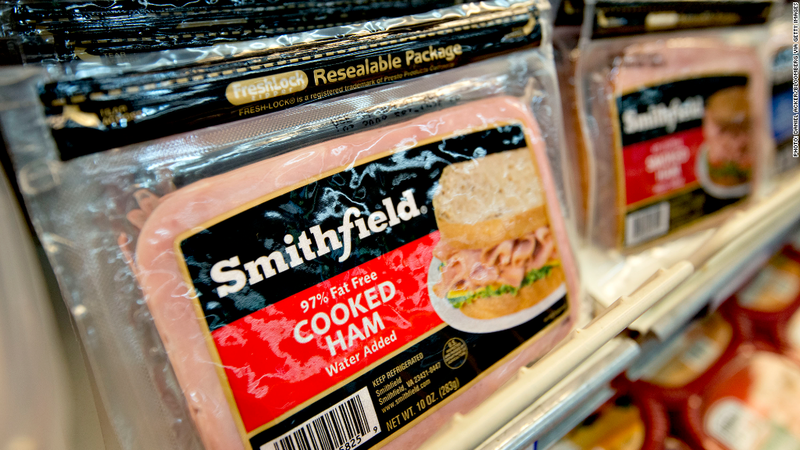 Virginia-based Smithfield, the world's largest pork processor, announced an agreement in May to be acquired by Chinese meat producer Shuanghui International for nearly $5 billion. The U.S. government is currently reviewing the proposed buyout, a process that could wrap up on Friday. If approved, it would be the largest acquisition of a U.S. company by a Chinese buyer. Little more than a week after the deal was announced, the SEC obtained an emergency court order to freeze Badin's U.S. brokerage account. Among his possible sources of information, the agency said, is "a Facebook friend who was an associate director at the investment bank for a different company that was considering a Smithfield acquisition." An SEC spokesman declined to comment on whether additional suspects are facing scrutiny. Badin agreed to the settlement without admitting or denying the allegations. "Our client is very pleased with the result," said Jose Lopez, a lawyer for Badin. "It was a mutually agreeable settlement in which some of the frozen funds were returned to him." The SEC also flagged possible insider trading following this year's other major food-industry acquisition, the $28 billion purchase of H.J. Heinz Co. by a consortium including Warren Buffett's Berkshire Hathaway (BRKA) and private equity firm 3G Capital. The agency obtained a court order in February to freeze a Swiss trading account that it said "unknown" investors had used to purchase options the day before the announcement, reaping $1.7 million in profits.